For 100 years and for three generations, Franklin Miller Inc. has been a leader in size reduction technology involving crushers, shredders, grinders and more. Our broad line of processors includes units for cannabis processing, chemical processing, pharmaceuticals, foodstuffs, minerals, wastewater treatment and many other industries. Our combination of experience in both dry solids processing and liquid or pressure seal systems has made us uniquely capable of solving many difficult customer process problems. Gosh, this sounds, like a great conversation. I’m sorry I can’t attend. Waste disposal has certainly become more of a hot button topic in recent years in our industry. This should be a great AMA today! Jake Galanty and Korkomaz Oz of Franklin Miller are our our hosts. Thanks for being with us today. Can you share a little about your backgrounds and the company’s background? Hi everyone, thanks so much for having us! We are looking forward to this AMA! Franklin Miller has been around quite a while – over 100 years and for three generations. We’ve been a leader in size reduction technology involving crushers, shredders, grinders and more. Our processors include units for cannabis processing, chemical processing, pharmaceuticals, foodstuffs, minerals, wastewater treatment and many other industries. Our combination of experience in both dry solids processing and liquid or pressure seal systems has made us uniquely capable of solving many difficult customer process problems. It appears you are uniquely qualified to deal with waste solutions. Many established brands have been reticent to make the leap into working with the cannabis industry. When did Franklin Miller transcend the traditional industrial sectors into cannabis waste disposal? We started to get calls about this a little over three years ago. When we looked into the market, we realized this was a perfect fit for our shredders. We have been expanding in the market ever since. As the cannabis/hemp industries grow, so does our place in them. It’s been a great fit. How did you acquire your first cannabis customer? What was that initial interaction like? Our reputation in size reduction brought our first cannabis customer our way. We used our experience in other industries to show what our shredders could handle in terms of their cannabis waste and processing needs. It was a great conversation/interaction that led to a very satisfied customer. Did you ever think that when you first made your foray into cannabis that it might lead to filming a scene in a show like Canna Cribs? Since the passage of the Farm Bill we are seeing a massive surge in hemp farming in the U.S. How are hemp farmers applying your equipment to their farming operations? Definitely not! When we sold our first machine in the Cannabis industry, we had no idea how big the industry was getting – and growing more every day. Such exciting times to be involved, as I know everyone here knows! We were so excited to be featured in the Canna Cribs episode. It was a lot of fun to have our shredders showcased. Franklin Miller has designed a two stage shredding system specifically for processing wet hemp, with a moisture content of up to 80% for safer hemp drying and maximum oil extraction. 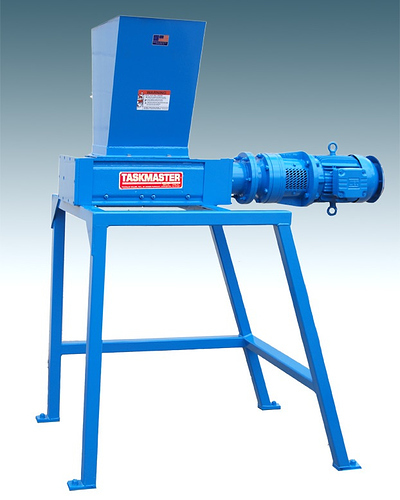 We are the first and only company with a system designed for shredding wet hemp. That’s amazing! Could you share some pics/specs of this equipment for our @memberdirectory to check out? Yes, definitely. We have drawings, pictures and specifications. I will get those uploaded after the AMA. Have you got any other cannabis-specific equipment that Franklin Miller has engineered? Yes! Our line of TASKMASTER shredders has been re-engineered for cannabis specific applications. Was there much re-engineering that went into making the Taskmaster cannabis-specific?